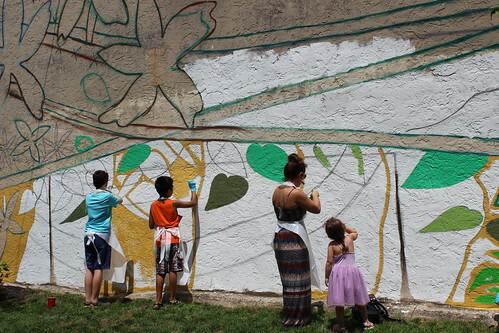 Last summer, we joined artist Paul Santoleri and Roxborough and residents for a community painting event that laid the foundation for Watershed, the mural that now overlooks the neighborhood’s newest community green space–Roxborough Pocket Park. Just in time for Earth Day weekend, Santoleri’s work is finished and will be celebrated with a dedication ceremony at 1 p.m. this Saturday, April 21st. Starting at noon, the “Art Is Life” event also marks the official opening of the park and will feature food trucks, live music, and local artisans. As sponsors of the mural, we will join Roxborough Development Corporation (RDC) in welcoming Watershed, which draws attention to the green transformation of the once-vacant asphalt lot at 6170 Ridge Ave. Working alongside Mural Arts Philadelphia and RDC, we commissioned Santoleri–a Roxborough native–to create a piece of art that captured the essence of the new pocket park and the community’s relationship with water. The result was a vibrant blend of history and nature that invites the community and visitors to take a closer look. Water elements, like the waves and ripples woven into each section of the mural, are reminders of how closely water connects all forms of life. The ball-like mass of water rolling downhill acknowledges Roxborough’s location at the top of a hill. As the divide between the Schuylkill River and Wissahickon Creek, Roxborough feeds into two of Philadelphia’s seven watersheds. Watershed is located within the Schuylkill watershed. On the opposite side of Ridge Avenue, most of the land drains into the Wissahickon Creek. In addition to Roxborough’s relationship with water, Santoleri pays tribute to the neighborhood’s connection to its past. Watershed is also a complement to another exciting feature of the park – its green stormwater infrastructure. The pocket park contains rain gardens and water-absorbing pavement that capture and filter polluted stormwater runoff before it enters our sewers and waterways. All of the species in the mural – from the red Bee Balm flowers to the red fox – are native to the Schuylkill and Wissahickon watersheds. The red salamander, which stands out thanks to a mosaic of tiles, is featured on PWD’s Wissahickon storm drain markers. Storm drain markers are a fun reminder that every drain leads to a creek or a river. Philadelphia residents can participate in marking storm drains around their community by ordering a free wildlife marker kit for their specific watershed. You can monitor which drains need marking, check off the drains that you’ve marked, and report damaged or missing markers by using PWD’s storm drain marking app. We hope to see you on Ridge Avenue! The site of Roxborough’s Pocket Park project, nestled between two buildings along Ridge Avenue, now features the beginnings of a water- and history-themed mural—a bright new addition to a still-developing space that the community hopes will be a keystone attraction for residents and visitors. Mural Arts worked with the Philadelphia Water Department and Roxborough Development Corp. (RDC) to commission Paul Santoleri, an internationally recognized artist and Roxborough native, to create the work. Nearly 60 Roxborough neighbors and visitors, including U.S Congressman Dwight Evans, participated in a June 25 Roxborough Community Paint Day and worked side-by-side with Santoleri for a communal painting event that got the new work started. "One mystery officials have pondered is why iodine-131 isn't showing up in many other places, or is found at lower levels than they see here. One reason: most other cities aren't looking for iodine-131. Plus, the Philadelphia region is a medical center, and a lot of sewage-treatment plants discharge into waterways that then flow past Philadelphia and into its drinking-water intakes." Visit our Iodine-131 information page, which includes FAQs, fact sheets and links to more news items. Each week, we profile a BMP—short for Best Management Practices—to demonstrate how local businesses, organizations and neighbors are helping to keep our streams and rivers clean by managing stormwater on their property. Before the Philadelphia Water Department constructed a stormwater wetland at Saylors Grove in Fairmount Park, the area received an excessive amount of runoff that drained into Monoshone Creek, a tributary to the Wissahickon, resulting in erosion of the Monoshone and impaired water quality. The creation of a one-acre wetland in 2006 now handles approximately 25 million gallons of urban stormwater each year, slowing the flow to the Monoshone and filtering the stormwater naturally by removing pollutants as the water cascades over rocks en route to the wetland. PWD continues to monitor this stormwater wetland to determine the reduction in stormwater flow to the creek and analyze its performance. It is estimated that the wetland intercepts 73% of the watershed's annual runoff. Learn more about this stormwater BMP project, find it on a map and view photos at the Temple-Villanova Sustainable Stormwater Initiative project page. After the jump, another photo of the fully vegetated wetland. PWD has been working to return streams to their natural state and create stable, healthy waterways able to sustain native vegetation and aquatic life. 2011 saw the restoration of Bells Mill—a 5,100-foot tributary to the Wissahickon—nearly completed, with grading and rock structures in place that will help stabilize the streambank and reduce erosion. With the addition of some landscaping in spring 2012, the project will be fully complete. Elsewhere in the Wissahickon watershed, stormwater wetlands at Cathedral Run and Wises Mill began functioning this year. These wetlands mitigate the impact of stormwater flows, reduce the amount of sediment that ends up in the streams and increase the diversity of aquatic vegetation in those wetland areas. Wises Mill Run, a tributary of Wissahickon Creek, is a waterway that's severely impacted by stormwater flows. After storms, the nearby neighborhood's storm sewers discharge a large volume of water into Wises Mill Run, resulting in erosion of the creek's bed. The Philadelphia Water Department led a project to divert runoff from the storm sewer into a two-tiered stormwater wetland that can hold 150,000 cubic feet of water. This wetland reduces peak flows to the creek by storing runoff before discharging it into the creek. The photo above depicts the wetland at work after Hurricane Irene. Learn more about this stormwater BMP project, find it on a map and view photos at the Temple-Villanova Sustainable Stormwater Initiative project page. Today's post-Hurricane Irene photos come from the Wissahickon, where at least one crayfish (above) was inconvenienced by flooding. After the jump, more shots of the raging Wissahickon, all courtesy of the Friends of the Wissahickon. "Officials from the Water Department, the EPA, and the DEP emphasize that the levels detected are tiny and don't constitute a public health threat. Philadelphia's drinking water meets standards for radioactivity and remains safe, they say. Even if it was getting into streams above Philadelphia, iodine-131 has such a short half-life - half the radioactivity is gone after eight days - that amounts would be much reduced by the time they were swept downstream. But, said Chris Crockett, the Water Department's deputy commissioner of environmental services, 'we don't want any iodine-131 in our water. I don't want it there for me or my kids and my family. And I don't want it for our neighbors and citizens.'" Be sure to read our Iodine-131 Q&A for PWD's official word on the topic. Once again, Philadelphia's drinking water is safe to drink. "'This project is more about reinterpreting the water space in Philadelphia,' [said Tod Seelie]. 'The experience of breaking the shore-to-water barrier and actually being in the water has a lot more implications than you might think.'" '"There is a real pressing need to find alternative ways of handling manure," said Jan Jarrett, president of PennFuture, a statewide environmental advocacy group. The federal Clean Water Act in the last 40 years has reduced so-called point source pollution or effluent from factories and sewage treatment plants. But farming, which was exempt from the act, increasingly has been responsible for more pollution, damaging waterways by flooding them with nutrients.